Happy Saturday everyone! 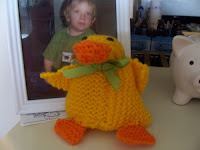 I just wanted to feature the work of a fantastic newer knitter like myself named heyknithappens on Ravelry, who made their very own knitted duck plush from my pattern that I posted a few months back! I love seeing someone else use a pattern I invented, especially when I'm such an amateur at it! You can check out heyknithappens on her blog here: Hey, Knit Happens! Even more exciting is to find out that she is from my hometown area :) Even though I'm living on what seems like the other side of the world from there now, it's always a nice surprise to meet others who share the same interests and familiarities of "home." Small world, huh? 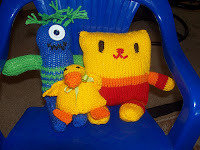 Just in case you can't check heyknithappens out on Ravelry, you can see Edgar, her version of the knitted duck plush, along with all of the other awesome stuff she has knitted on flickr for your convenience. You should definitely check her out... just look at the cute things she has knitted! The images in this blog post belong to/are copyright to heyknithappens and come from her flickr photo stream :) The first photo is  and the second is . Enjoy, and thanks for sharing your work, heyknithappens! you're so welcome! I love your little creatures, and I know what you mean about having all these character ideas in your head, lol :) I can't wait to see your new stuff!